For those who have been watching the recent comic book sales figures, it is pretty clear that DC Comics needs to do something. Marvel was dominating them before 2015 happened, then Marvel started releasing the massively popular Star Wars books, blew their Convergence out of the water with Secret Wars, and did a complete reboot that made the final quarter of the year almost uniformly dominated by Marvel. The Vertigo relaunch brought in the critical acclaim, but the DCU was struggling, with only Batman ever reaching anywhere near the top of the list. Now, only about five years since the New 52 relaunch, DC Comics is confirming that they will be doing another reboot this coming summer. This will come directly after the main titles, which have followed a regular monthly schedule since the relaunch, will reach issue number 52. The new launch, called Rebirth, has had mixed information swarming about it. While it clearly looks like a reboot, Geoff Johns has said publicly on his Instagram that is is, in fact, not. At this point, we know that it is happening in June 2016, and a few other tidbits that we are trying to put together into a coherent understanding of what is taking place. First, we know that Scott Snyder and Greg Capullo are leaving Batman, which is going to be heading to a bi-monthly format. This is likely because it is the one DC book that seems to compete with Marvel’s top titles, and it may be moving towards multiple creators like the Eternal books to keep up with the schedule. Snyder and Capullo have announced that they will then be heading to Detective Comics, which will be the reboot for that secondary Batman title. Wonder Woman will also be heading to a bi-weekly format, with Margeurite Bennett likely to take on the writing role. 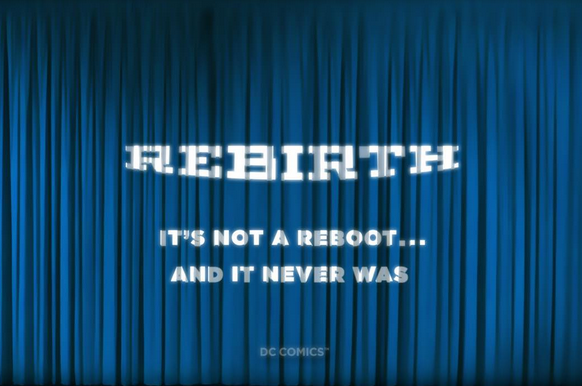 The relaunch itself, which we have yet to see clear solicits for, will likely begin with a Rebirth prefix of some sort. This could act as, for example, Batman Rebirth #1 before the first issue, or just a Rebirth one-shot for each comic. This will act as a transition, and will again do the themed one-shot option that you will likely see in the quarter bins shortly after, just as you did with the Futures End ones. To know what’s coming we have to look at what is going on with DC currently, and what we will be getting come April, before the end and beginning start. Comic Book Resources has put this together in stellar fashion, breaking down the 38 regular DCU titles coming in April and how it plays towards Rebirth. 4 series with what I call “first-tier multimedia support” (i.e., having a corresponding current or upcoming movie or TV adaptation): “Aquaman,” “Cyborg,” “Green Arrow” and “Suicide Squad.” I think these particular series would be safe anyway, but their multimedia exposure definitely doesn’t hurt. 6 series with second-tier multimedia support (i.e., starring a character who’s part of a movie or TV supporting cast): “Black Canary,” “Constantine,” “Deathstroke,” “Harley Quinn” & “Little Black Book” and “Martian Manhunter.” Clearly Harley’s two titles are safe, and we might argue about the value of “Arrow” and “Supergirl” to “Black Canary” and “Martian Manhunter”; but on balance I suspect DC would rather retool those books if necessary and continue to capitalize on whatever goodwill their TV counterparts might generate. That leaves 16 books on the bubble. In December’s sales-rank order, they are Bryan Hitch’s “JLA” (35), “Batman/Superman” (87), “We Are Robin” (93), “Teen Titans” (105/100 for two issues), “Red Hood/Arsenal” (107), “Superman/Wonder Woman” (110), “Earth 2: Society” (112), “Batman Beyond” (124), “Starfire” (129), “Sinestro” (151), “Gotham Academy” (two issues, 157/120), “Secret Six” (167), “Justice League 3001” (171), “Doctor Fate” (183), “Midnighter” (191), and “Omega Men” (213). Right now, we know that Prez, Starfire and Omega Men will be canceled, though Prez was just a maxiseries to begin with. We also do not expect Justice League 3001, Secret Six, Doctor Fate and Red Hood/Arsenal. Many people are also questioning whether Batman Beyond and Earth 2 will continue despite stable sales, but these have been important back-up non-continuity titles that still relate to the mainstream DCU. To back-up new television shows like Supergirl and Legends of Tomorrow they are likely to produce comics for that as well, and we could see the We Are Robin format extend to Red Hood and others. In all honesty, most of this is speculation based one what has been successful for DC, and what has not. Right now, anything Batman is a good fit, as is anything including Superman and Wonder Woman, though their miniseries have been better off than their ongoing series. Harley Quinn is safe, and any of the baseline titles like Green Lantern and JLA are going to remain staples. Beyond that we need to look to what is going to support their multimedia efforts, which means maintaining Green Lantern, Cyborg, Teen Titans, Suicide Squad, and this may even mean continuing the strange surprise, Martian Manhunter. We should be getting updates on this weekly, so we will continue to follow every bit of news as it comes out.